Ein Erasmus + Projekt, der Strategische Partnerschaft in der Erwachsenen -Bildung, dass vom 11. bis 18. September 2018, Frankfurt am Main im Künstlerinnenhaus Mousonturm und dem Jugendhaus Heideplatz realisiert wurde. Die EU-Erasmus + KA1-Studie „job shadowing“ zu den sozialkulturellen Projekten mit dem Fokus auf unbegleitete Minderjährige (UMF) und junge Erwachsene mit Bildungsnachteilen, realisiert vom ÜberBrücken Kollektiv, startete am 26. Juli 2018. Die Forschung wird von Maria Munoz und Bernard Stehle im Auftrag von Espaco Enterno, der Universität Granada durchgeführt worden. Ich freue mich über die Vielfalt der mitwirkenden TeilnehmerInnen, sowohl bekannte Direktorinnen sozio-kultureller Einrichtungen aus Frankfurt, Hamburg und Berlin bis hin zu jungen Flüchtlingen, die drei Jahre an den ÜB-Tanztheaterprojekten teilgenommen haben, einschließlich der Mitglieder unseres ÜB-Teams und auch eine verantwortliche Person der Grünen Partei für soziale und kulturelle Angelegenheiten, Integration und Bildung mit dem Fokus auf die Flüchtlingssituation in Frankfurt werden sich der Forschung zur Situation der Geflüchteten in diesen Zeiten „heute“ anschließen. Dieses Projekt wird mittels Interviews und durch Feldforschung, während der Realisierung von Tanztheaterprojekte entwickelt. In the course of European history, from the Greeks to the Romans over the Middle Ages up to the modern age, there is a clear relationship between „art“ and its influence on the physical and mental well – being and its effect on the health of the people and their detectable advantages for the prevention of diseases. For this reason, we have Fundacao Escuela Solidaridad (SP), the social organisations Artemide (I), Espacio Interno (SP) and the UeberBruecken Kollektiv/Overbridges collective (D), which collectively decided a project with colleagues from different European countries, on the domain of art therapy, regarding the „application“, in the artistic, therapeutic and educational field, for people from disadvantaged life situations The risk of social exclusion. These methods are intended to provide the opportunity for professionals to continue their education and to use innovative practices that aim at a healing effect and at the same time offer an opportunity for the art therapy in our society to provide more visibility and recognition. Our new seminar will take place in May 2019 in Granada Spain. The Foundation FES will be our hosting institution. Silvia Paradiso and Ivan Veradi from the social organization Artemide/Landing Latiano (I). Artemide Social Cooperative, founded in 2000, works predominantly in the field of social activity, the focus of its attention being on children, young people and the family. Simone Wedel co-founder of the ÜberBrücken /over-bridges collective, production manageress, video artist and sound and light technician in process. Carina Sperk (G) –Carina is an actress and singer and is in her study period to become a graduated theatre therapist. In 2012 she graduated in psychology but did not devote herself only since then the exploration of the theatrical space. Maria Munoz-Grandes, M.A., M.Ed., M.Sc. Professor of Psychology and Organizational Development at IE UniversityPsychotherapist, Coach and Consultant and participant of the upcoming job shadowing EU Erasmus + KA1 project on social artistic projects in Germany with the main focus of the integration of young refugees. Michelle Gerhardt (G)- student in the field of social work culture and media at the Frankfurt University of Applied Science and trainee and budding very actively involved and co-organizing production manager of ÜberBrücken in her second production. Jolanta Rekawek (Polen, Brazil) – Dr. Prof. at the Federal University of Feira de Santana UEFS in Brazi. 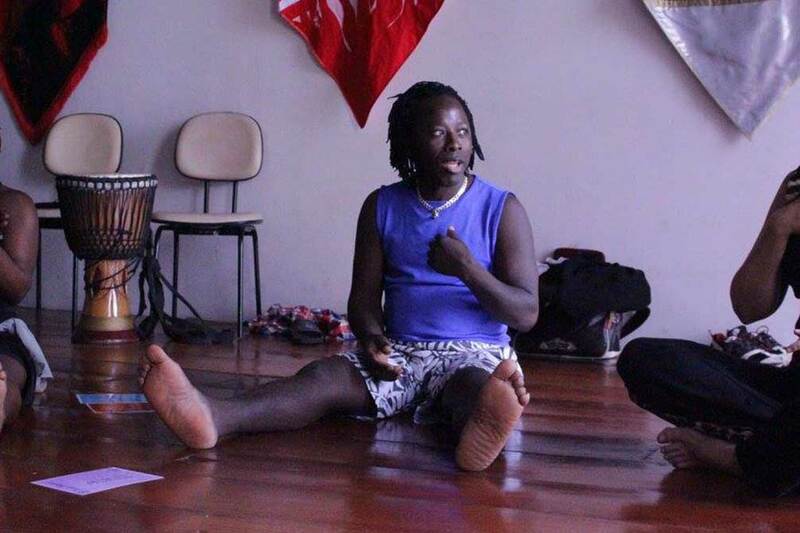 Founder of the Nucleo Performativity NESP, and co-creator of the dance-theater Performance „eles nao querem nada“ together with Frank Händeler and the students. Last but not least, Frank Händeler MA (D, NL, Brazil): choreographer, dance theater scientist and pedagogue and artistic responsible for the ÜberBrüchken/ over-bridges collective.